In the Mediterranean area, Italy represents the central point of olive production because of its history and environmental conditions. 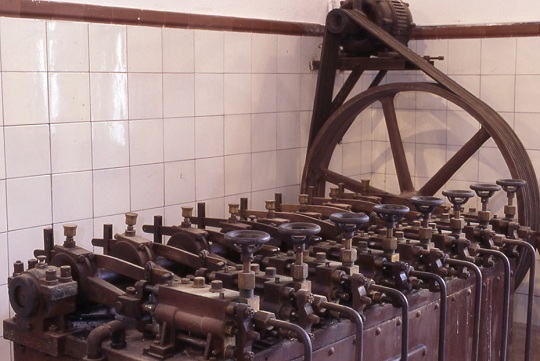 As such, it can be considered as an open laboratory producing the latest and most advanced technologies able to support, for itself and for the world, the development of olive-production techniques and practices. Olive species are considered to have originated in the Near East Mediterranean area (specifically Minor Asia, between Pamir and Turkstain). Olive production commenced in Italy in the VIII–VII century BC and gained considerable economic importance thanks to, first, the Phoenicians, and, later, the Greeks. 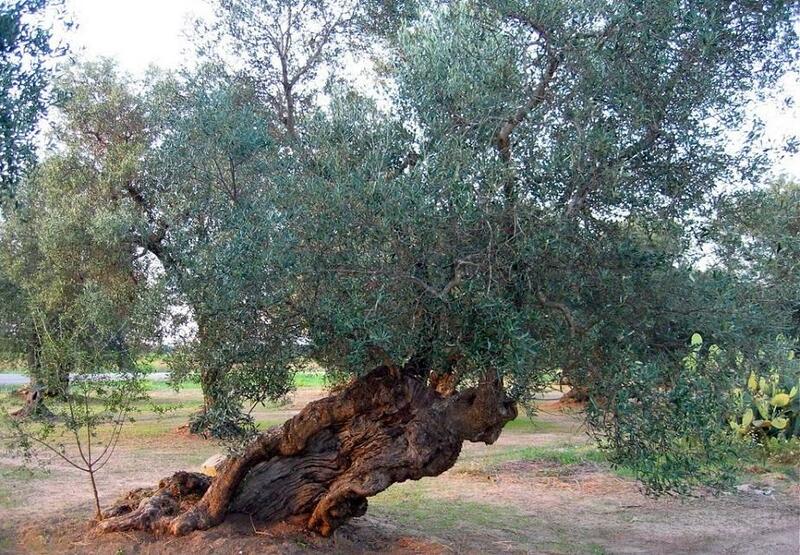 At the same time, olive production developed along the coastal and subcoastal areas of the eastern Mediterranean Sea, including southern European and northern African countries, advancing later with the Romans to the northern areas of Italy, Spain, France and the Balkans. Olive is present in 18 regions out of 20, it is mainly prevalent in the southern regions and islands, particularly in the regions of Puglia, Calabria, Sicily, Basilicata and Sardinia.For the very characteristics of the plant, which requires a mild climate, the cultivation of olive trees in Italy is widespread in the central regions (19%) and South (80%), while in the north the production is more limited (2%). The plants in production are about 170 million and farms dealing in the olivicoltura sector are more than one million. 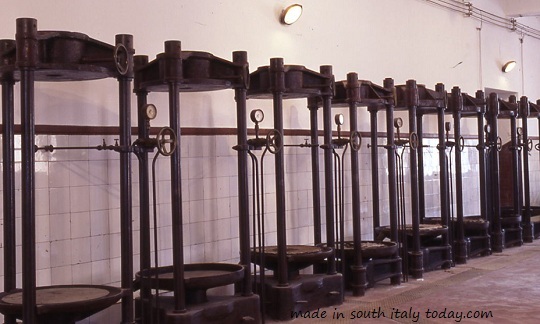 In Italy there are about 6.180 olive oil mills. 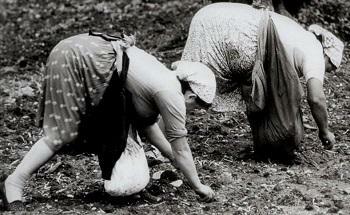 The more consistent producer in the North is Liguria, with 17 thousand hectares. 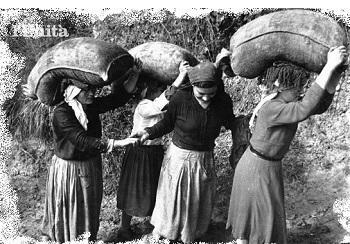 The more consistent highest yielding producer is Calabria (5.5 tons per hectare). The southern and insular area, as reported above, is the largest in terms of production area. The area includes Sicily, Sardinia, Calabria, Puglia and Basilicata, considered the warm climate subarea for olive cultivation. Some internal areas of Sicily, Sardinia,Calabria, Basilicata and the coastal area of Puglia are considered as medium climate areas. In this first area, because of the favorable climate for olive production, it is possible to obtain high yields where plant-water needs are satisfied through irrigation. 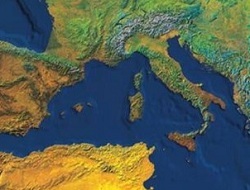 In the past, large areas of southern Italy were characterized by low-quality olive oil. 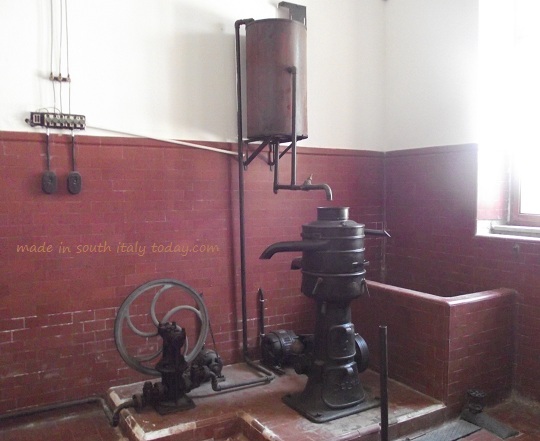 However, technological improvements both in the field and in extraction processes have led to a remarkable increase in olive-oil quality, particularly in the production of extra-virgin oils in Sicily, Sardinia, Puglia and Calabria. In terms of marketing, oil from southern Italy achieves low values owing to poor marketing strategies. However, it is possible to observe successful marketing by some operators that reach high a standard in terms of oil quality. The central-southern area includes lower Lazio, Abruzzo, Campania and Molise. 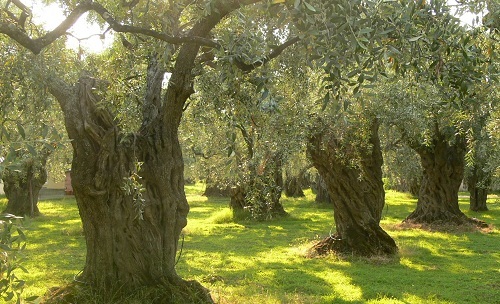 It is considered the medium climate subarea for olive cultivation, except for some coastal areas in Campania, which are included in the warm subarea. In general, the environmental conditions of this area ensure optimal productivity. Maximum yields are gained with supplemental irrigation, based on seasonal conditions and plant requirements. In terms of marketing, the full value of the product has not been achieved yet owing to a lack of concentration of product and adequate marketing strategies. 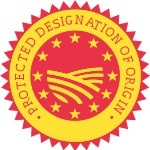 In this area, fresh olive and oil marketing can be observed – better than in the northern areas of the country where the production tends to be low. 5 kg of olives to make one liter of oil? The northern area includes the central-northern olive-producing regions of Lazio, Marche, Umbria, Tuscany, Liguria, Emilia Romagna, Lombardy and Veneto. In general, the oil production in this area is much lower than in the other two areas. From the climate point of view, this area can be included in the cold subarea, except for the coastal areas of Liguria and south of Tuscany. Generally speaking, the environment is not suited to maximum productivity in terms of olive quantity and annual bearing. It is possible to observe recurring damage from cold weather, which can sometimes destroy flowering buds and, partially or totally, the canopy. The oil is generally of medium to high quality, depending on the local tradition of good harvesting practices and oil-extraction processes, particularly in Tuscany, Umbria, northern Lazio, Liguria and Lake Garda. The extra-virgin olive-oil quality of this extreme area of olive growing commands medium and high prices. However, olive growing in this region is not always profitable owing to the low productivity of the olive orchards and the high cost of production. 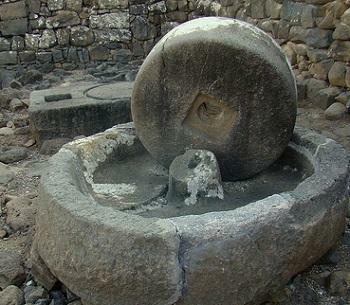 The picture below were taken at Museo del Frantoio in the archeological park of Scolacium, also known as La Roccelletta in the Province of Catanzaro, Calabria. 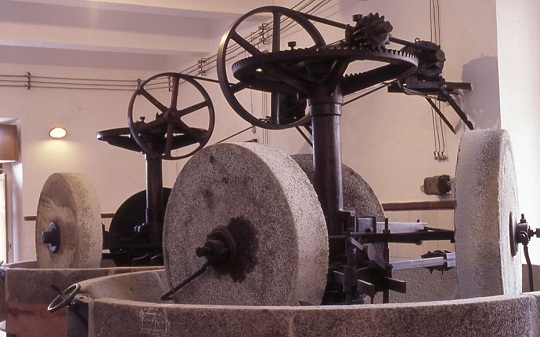 One of Italy's first olive oil mill geared for high production. 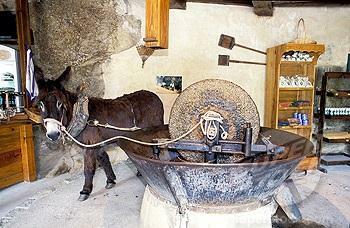 Below, presses for squeezing the olive paste. 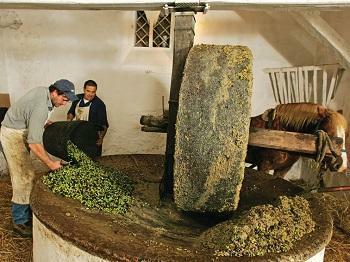 (pomace) from the above presses. Below: Pumps driving the oil to the separator. 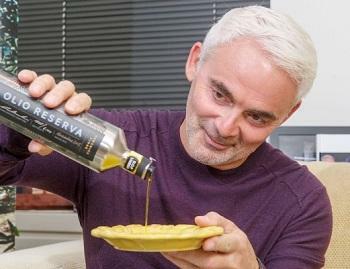 For billionaire Frank Giustra, investing in the olive oil industry is not a hobby. He has faith that the industry will adhere to quality standards and that consumers will learn to better discern quality, and be willing to pay for it. Giustra purchased groves in Orvieto and hired master producer Cesare Bianchini to run the farm. The second year of production, Giustra entered his oil in the New York International Olive Oil Competition and earned the highest score out of the nearly 700 entries. Giustra said that when he started the commercial operation, he was “determined to create something spectacular.” The olive trees were already in a perfect location — an ancient seabed rich with minerals and planted on a hillside above the level where fruit flies lay their eggs. Olive are hand-picked early (in October) when the olives are higher in polyphenols and flavor and press the oil within four hours of harvest. 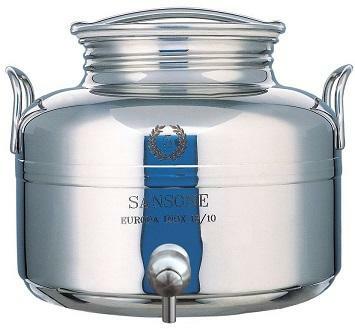 The holding tanks are nitrogen sealed to prevent oxidation, and the oil is bottled in nitrogen-sealed, stainless steel containers to control temperature and eliminate light. Such attention to detail is costly. The oil is extremely expensive to make and because the groves are relatively small, there are no economies of scale. Competing against large olive oil producers who “do not go to the same efforts and who blend with sub-par ingredients,” said Giustra. The difference in the cost of grocery store oil and boutique oil is very big, indicated Giustra, who knows that he will lose money in the short-term. As a successful financier, one might wonder why Giustra would choose to invest in a business where it is difficult to make a profit. Giustra views his olive oil venture as one with long-term potential. He believes that the market for quality oil is “exploding worldwide” and since olive oil can only be made in certain places in the world, the supply is limited. Those who make the absolute best oils will find their market and will be able to price it appropriately, said Giustra. Giustra sees the olive oil industry in a similar place to where the wine industry was 20 years ago. Public acceptance of boutique olive oil and its higher prices are in an early phase.It will be an uphill climb and will require change in industry practices and consumer education. Giustra believes that “we need to embarrass the large companies” that are selling fraudulent oil and need to educate consumers. Giustra experienced his “ah-ha” moment when he took his first taste of Orvieta olive oil. Since then, he has been passionate about sharing his new-found love with the world. Giustra named his oil Domenica Fiore, in honor of his Italian-born mother who instilled in him an appreciation for a fresh, healthy food. Wherever he travels, he carries a bottle of his premium oil with him to share with people he meets. To remember : Olive oil does not improve with age, but it can last a long time if stored properly. One of the main enemies of the oil is light, both the direct and diffuse. Olives contain chlorophyll, a substance used in photosynthesis to convert light energy absorbed into oxygen and sugars. Chlorophyll is responsible for the green color, typical mainly of new oils. Chlorophyll is an excellent preservative, because it is an antioxidant, but only in the dark. If the oil is exposed to the sun chlorophyll becomes the cause of oxidation that causes a gradual depletion of its quality in the long run to rancidity. For this reason, the oil must always be kept in containers slightly permeable to light. The dark and opaque glass is one of the most suitable materials to its preservation. Stainless steel is the best material for storing large quantities of oil, has the same characteristics of impermeability of the glass bottle and protects integrally from light. The extra virgin olive oil should be stored in a cool, dry place away from heat sources, in environments with temperature is not excessive (at a temperature between 14 and 20 ° C), it should be absolutely protected from direct sunlight and from 'air. 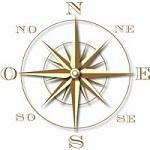 In this situation, the optimal quality of the product remains intact for more than 36 months. With the low temperatures the oil may actually freeze, for which, before starting his consumption, return the container at room temperature (16-18 ° C) for a few minutes and shake repeatedly, to facilitate the return of the product to natural state.